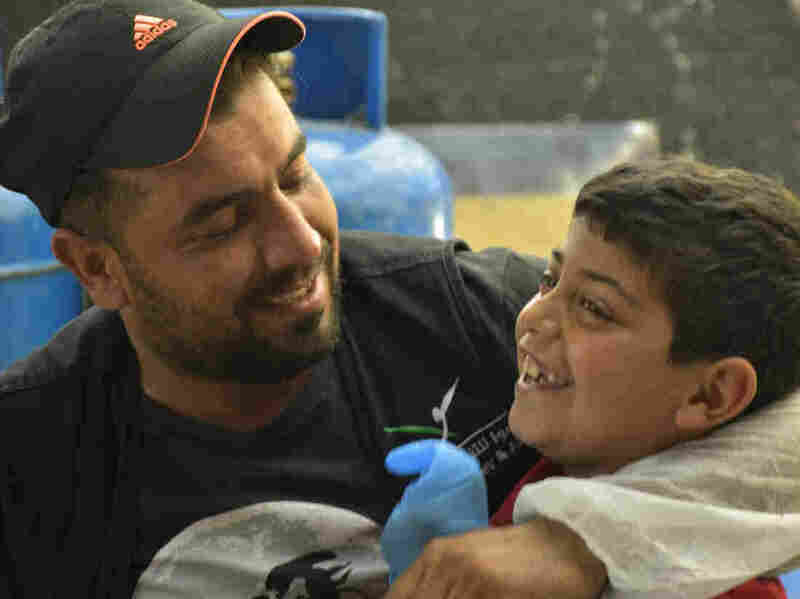 'Ramadan Kitchen' In Bekaa Valley Gives Syrian Refugees A Taste Of Home : Goats and Soda The kitchen serves 5,000 iftar meals daily to displaced families living in camps in the Bekaa Valley of Lebanon during Ramadan. For many, it offers a sense of community, family and tradition. Anas, left, and Bashar, 8, bond in the Ramadan Kitchen. Haider Hammoud often goes tent-to-tent at the refugee camps near the Syrian border asking families whether they've enjoyed their iftar meal. It's the Muslim holy month of Ramadan and the Syrian 32-year-old wants to ensure that when the sun goes down, displaced families break their fasts with a taste of home-cooked food. Thousands of families are living between the cornfields of Lebanon's Bekaa Valley and they've all escaped war-torn Syria in the last seven years. At the nearby Ramadan Kitchen, as it's referred to by the Syrian community, refugees work together to prepare 5,000 iftar meals daily. It's part of a month-long initiative run by a local Lebanese charity called Sawa for Development and Aid. Sawa means "together" in Arabic. The kitchen has been open for the past five years and is funded by Sawa through donations. Most of the food is purchased at a local farmer's market near the camp. Each day, the charity provides meals to some of the 22 camps in the area, and rotates the schedule. Families that do not get an iftar package from Sawa must rely on food aid from the U.N. or other charities, or buy food for themselves if they can afford it. I visited the Bekaa Valley to get a sense of how Sawa's volunteers provide a communal atmosphere during Ramadan. The unwritten rule is, if you're in the Ramadan Kitchen, you've got to grab a hairnet and blue nylon gloves and start assisting. Most of time, the kitchen cooks traditional Syrian food, often meat and rice topped with nuts. It's part of a package of food that includes a box of meat pies, a pack of Arabic bread, a box of dates and fresh salad. I ended up working with the chefs on the night shift, preparing the main dish for the next day: pizza. The chefs stayed up all night baking 8,500 pies. It gave me a glimpse of Sawa's work and the life of the people it serves. Hammoud, who's the operations manager for Sawa, says the kitchen is meant to give agency to refugees while creating community at a time when people need it most. "We're trying to revive what we've lost as a displaced people: the spirit of Ramadan, the community of Ramadan where people are eating the same food, where neighbors are exchanging dishes with each other," says Hammoud. "There are little things that we miss like the Ramadan-exclusive drink jalaab, which is [flavored with] dates, rose water and grape molasses. We need to keep our traditions alive, and we as Syrians need to do it for ourselves." 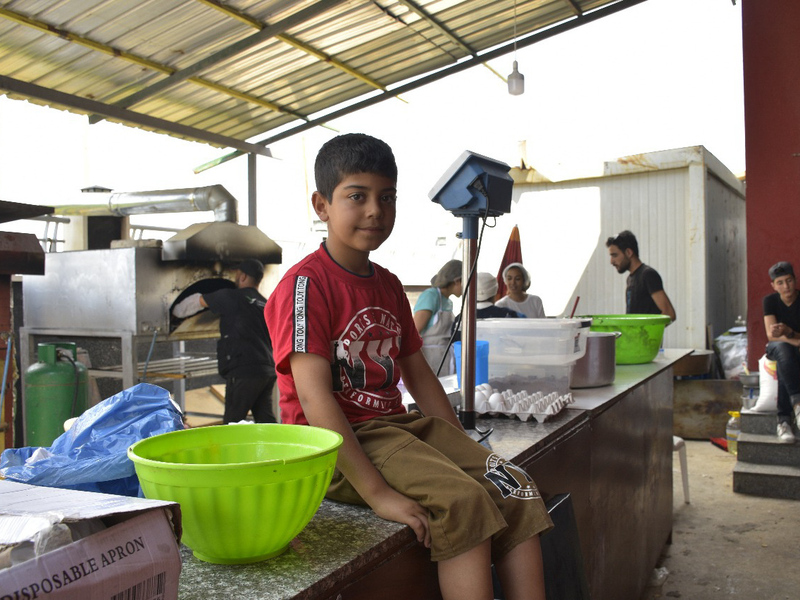 Hammoud remembers Ramadan in Syria before becoming displaced. He says it was a month where people would gather together and share meals. Even after the war began in 2011, Ramadan, he says, was still a moment in time when people would to take a step back, reflect and come together to break bread, from both sides of the war. "But everything changed when we became refugees." Bashar, sits on a table for prepping meals in the Ramadan Kitchen. The kitchen brings together a variety of people: a former professional soccer player who played for the Syrian national team, an injured baker, an art critic, a single mother. One group chops vegetables for the salad, others package dates and bread for distribution, and there's always one person with a broom anticipating spillage. One of the volunteers, Ibtihal Hola, calls her 8-year-old son Bashar over as she waves a yellow T-shirt and matching vest over her head. She wants to show him his new Eid outfit, which was given to her by another woman working in the kitchen. She says in the Middle East it's a very important custom to buy new clothes to wear during the holidays. Hola has been bringing her son to the the Ramadan Kitchen for the past three years and people there have become family. Hola left Syria with her children in 2013, after her husband went missing in their hometown of Homs. She's not sure whether he's alive or dead, but what she does know is that she must continue moving forward for her kids. She says the kitchen has provided an outlet for her son and has given him great male role models. One of the men in the kitchen, Anas, often sneaks treats to Bashar and plays little games with him. He tells me that only a dirt road separated his house from Hola's family back in Syria. But they've only met in this place, after the war. A few tables down, Marwa Bakabas, a Yemeni-American volunteer with Sawa, is assisting with meal preparations. Another volunteer tries to jokingly spray her with a hose. Bakabas is on a first-name basis with most of the people in the kitchen. She says they have now become her family, and even lived with some of them when she was based in the Bekaa Valley a few months ago before relocating to Beirut, where she commutes from. Bakabas says when she moved to Lebanon from the U.S. to work with refugees, she found it difficult to find the right organization to volunteer with. She spent a lot of time working with different international groups in Greece who were also helping Syrians. "Sawa actually engages the community," she says. "Most NGOs [non-governmental organizations] just play the beneficiaries for these communities. They come in, drop off food and leave." Chef Abu Emad, who was displaced from the countryside of Damascus, commands the kitchen. In his 60s, he sports a thick mustache. His voice is soft but authoritative as he gives cooking instructions. The chef's job can be tough sometimes. One of the volunteers, who preferred not to be named, says the there are a lot of passionate opinions around the kitchen about how a specific dish should be made. And sometimes the community gives the chef a hard time when the final result is not up to par. "We had a major crisis with a pot of rice a few days ago. It wasn't spiced correctly," says the volunteer. "We care about turning out quality food. If it's not something we'd eat in our house then it's not something we'd serve to our community." Once harmony in the kitchen is restored and tensions cool off, it's time for packaging and distribution. The volunteers come together to sing nostalgic Arabic songs while filling up the boxes and place them in an assembly line. They then pack up the boxes into vans and distribute them to their neighbors around the refugee camps before the sun goes down. For many families who are fasting for Ramadan, this will be their main meal for the day. And how does the food taste? I couldn't try it because I was fasting. But little Bashar had a response: he wants more pizza!